I have recently picked up a project to be created using PHP. It has been great to get back into PHP as I have not used it in a while (since PHP 4.3). For some reason, web sharing was removed from OS X Mountain Lion; removing the one click activation of Apache. PHP is still there and can be configured easily from the terminal. This post explains how to activate PHP, Pear and Xdebug using the system installation. For convenience, I recommend using a separate stack for development, such as MAMP. I shall post about that later. If you intend to develop on your Mac then I recommend installing Xcode from the App Store. 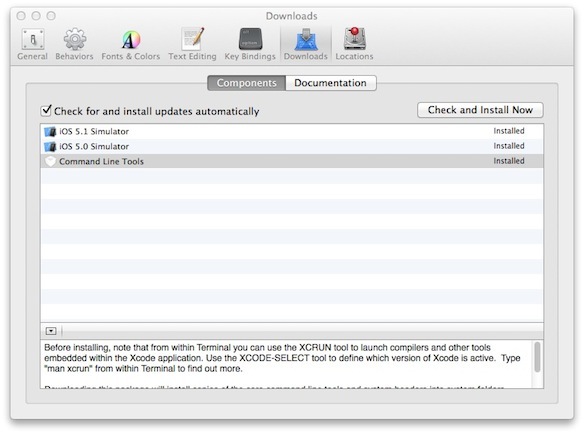 Once you have Xcode installed, launch the program and go to preferences. Click on the Downloads tab install the Command Line Tools. This will make compilers available, such as gcc, for building extensions and packages. Use the default initialisation file and copy it to the same directory as ‘php.ini’. You will need to provide your administrative account password for sudo commands. You should now be able to execute php with the -v switch to get the current version and determine that it is installed. Finally, get Pear to upgrade itself and all of its packages. From the terminal prompt, get Pecl to install Xdebug. Pecl will install Xdebug as an extension and create a new line in your php.ini file referencing the extension. This will not work correctly as Xdebug needs to be loaded as Zend extension. This can be corrected with a brief and simple change to php.ini. Save php.ini and you should now have a working PHP with Xdebug using Mountain Lion. Unless explicitly stated otherwise, the articles and content published on this web site are licensed under a Creative Commons Attribution-NonCommercial-ShareAlike 3.0 Unported License.